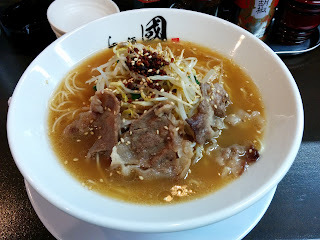 Today's shop Ramen Kuni replaces shop Bikkuri Gamu Champon in a side street by Daikokucho. Kuni prides itself on Hiroshima kone, a cut of beef specific to the region. It is from a part of the cow's front legs, and is filled with collagen and gelatin, supposedly making it good for your skin. At any rate I was ready to try some so I ordered the standard shoyu. This was on the lighter side of ramen I've had. It was a simple oil ramen, tasting mostly of bean sprouts and sesame, like a stir fry. The noodles were long and thin, but didn't add any additional flavor. The beef was fine, too, but didn't live up to the expectations I had of a place that was supposed to be famous for it. There was nothing offensive about this bowl, but nothing that lasted in my mind either.